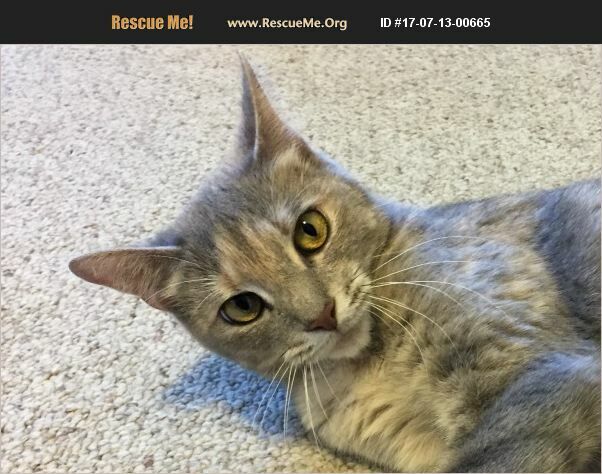 Chloe ~ Female Torbie~ 1 �%BD to 2 years old (as of 7/10/17) As a rescue, we generally only take in stray/feral/abandoned cats and kittens that we find out on the streets of Central Falls. The only time that we make an exception is when an animal is owned by someone who is no longer physically able to care for them and the animal is in need of help. Chloe was taken in by our ACO when a gentleman with health issues was no longer able to take care of her. Due to her situation, Chloe began to suffer the consequences. Now that she is with our foster couple she is putting on weight and getting better every day. Chloe is a very pretty and slender torbie (tabby/torti combo) who is a love but sometimes she likes it ion her terms. She likes to be patted but is not into rear-end scratches :) She's just a young girl looking for some stability in her life. Our adoptions run as follows: When someone shows an interest in one of our pets we respond with an email with an attached application. Once your application is emailed back to us, and a background check is completed, a meeting with the animal goes forward. We are a rescue group which means all of our cats/kittens are technically in foster care. We are not set up for drop in visits. All of our contact is done through e-mails until you are called by David who is the gentleman that reviews all of our applicants. Dave is the one with all of the background information on the cats/kittens. Our adoption fee is $150.00 per pet. All of our cats/kittens are fully vetted, current on all shots, micro-chipped and spayed/neutered before heading home. P.S. : Our ACO is not involved with any of the cat/kitten placement procedures so please do not contact her for assistance. You will simply be sent back to us. Thank you!! !